Subscribe to Org4life News. Receive monthly emailed tips, resources, and inspiration — and get your complimentary copy of the Original Clutter Flow Chart in the bargain! Subscribe to my Blog. Peruse categories of motivational and how-to articles, and enter search terms to find what you want. Or, ask me if I’ve covered the topic you are interested in. I’m happy to point you in the right direction, even if it’s not on my website. Follow me on Facebook, Twitter and Pinterest (OK, that last one isn’t up to date…the first two are quite active, though…). Join the conversation! 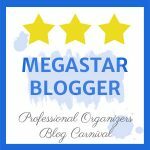 Take Advantage of the DIY Organizing section of my website, full of Resource Roundups on various topics. Do you want to organize your Home, Office, Time or Mind? Schedule a call to tell me your story and see if we’re a match. I’ll talk to anyone about anything for free for 20 minutes. Sometimes that’s all it takes! Download your copies of three free Get Organized! tips booklets (no-strings-attached e-books from PONM, the local professional group I co-founded in 2005). Enjoy and learn from articles, radio programs, video, and podcasts that I’ve contributed to and been featured in on my Media page and YouTube channel. Join forces with a friend and take turns helping each other clean out your closets, pantries and garages! Try my Quick Fix Service. This is a great way to sample Org4life virtual services! Order my Clutter Flow Charts – The Org4life-branded charts (with egret logo) are for your own personal use. The Custom-Branded charts (featuring your logo, colors and and contact info, including limited distribution rights) are for use with your clients and marketing prospects. With these handy tools by your side, clutter will simply FLOW out of your home, office and life – collect ‘em all! Click here to read endorsements from Clutter Flow Chart fans. Order my e-workbook: Go with The Flow! The Clutter-Clearing Tool Kit for an Organized Life — For less than the price of an hour with a professional organizer you can have all 15 of my Clutter Flow Charts, plus companion articles, worksheets, click-able resources and instructions for use (67-page PDF format download). Plus 2 bonus charts! Org4life Menu of Services: If you live in the greater Albuquerque area, hire me to come help you accomplish your organizing goals. Together we’ll get it done faster and have fun doing it! Click here to read testimonials from happy Org4life clients! Org4life Virtual Services — I can coach you through your DIY organizing project — ranging from clearing clutter and creating your ideal schedule, to planning a move, redesigning your living room, and researching your family tree — with the use of digital photos, emails and telephone calls or video chats. It’s fun! It’s affordable! It’s effective! Satisfaction guaranteed. Why not give it a try? Fly me in. I can come help you in person. If you line up a few friends for me who also want organizing help, you can split my travel fees. Contact me for a quote. Hire a professional near you. Remember when I said there’s only one of me? Well, actually there are 4000 of me! 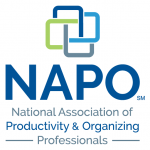 You have my blessings to hire one of my NAPO, APPO, ICD, or other affiliated organizing association colleagues located near you. I’ll even help you pick one, if you like. I know many of them personally through my volunteer roles and conferences. Or, try searching yourself, on their websites, filtering by zip code and desired services. Association members are more professional in their business practices. They follow a Code of Ethics. They have access to training and the support of a community of other organizers. They keep up on the latest products and methods of transferring skills to their clients. They don’t just tidy up for you and call it a day. Unprofessional help. Lots of people can help you clean and move things around for cheap. And that may be all you need. But for problem-solving, habit-altering, life-changing help, I recommend sticking with professionals as described above. What is your organizing challenge? What is your budget (time, money, energy)? Click here to schedule a free 20-minute call. Copyright 2010-2019 by Hazel Thornton, Organized For Life. This is great, Hazel – something for everyone! I may have to steal borrow your idea for my own site! This list is so comprehensive, informative and, most of all, helpful! Such a wealth of supports for your colleagues and clients. It’s like the Library of Hazel!